2 TIMOTHY 1:13 KJV "Hold fast the form of sound words, which thou hast heard of me, in faith and love which is in Christ Jesus." Holde fast the fourme of sound words, which thou hast heard of mee, in faith and loue, which is in Christ Iesus. Keep the form of those true words which you had from me, in faith and love which is in Christ Jesus. Have an outline of sound words, which [words] thou hast heard of me, in faith and love which [are] in Christ Jesus. 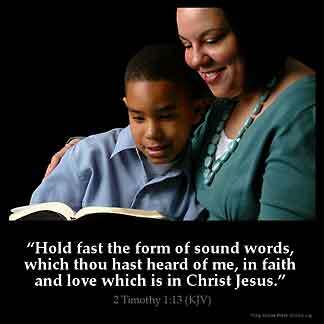 Hold fast the form of sound words, which thou hast heard from me, in faith and love which is in Christ Jesus. Provide yourself with an outline of the sound teaching which you have heard from my lips, and be true to the faith and love which are in Christ Jesus. Haue thou the fourme of hoolsum wordis, whiche thou herdist of me in feith and loue in Crist Jhesu. 1:13 The pattern of sound words - The model of pure, wholesome doctrine. 2Ti 1:13 Hold fast the form of sound words. Hold and teach sound doctrine, the pure faith, the gospel as Paul taught it to him, preaching it "in faith and love". 'and of sound mind, he has given us, we should therefore hold fast to these doctrines knowing that we will have peace from the the enemy's destruction and from the world's problems. You failed to mention an important word in this scripture. The word form which means in Greek tupos which means pattern. Your words can be sound put if they don 't follow the pattern then they are useless. If you desire to be a true Christian you can 't divert from this pattern. Are you a true Christian? Timothy was properly instructed and supported by his mentor Paul. Paul is reminding him of the requirements that he was taught. Without good mentors and leaders there is a great chance we can fail. Sound words personally to me means something that we can derive and deduce in the life of our Lord Jesus Christ. Examples are faith, love, prayer, evangelism, sound doctrine etc. According to 2Timothy 1 13, two words are important, that is, Faith and Love. Jesus was the origination of faith even encouraging us to have faith. Heb 11vs6. Also, Jesus was the author and genesis of Love. He love us and gave his life for us. So, anything we had heard about him, we should put them into practice.